by Jeff Cavins and Sarah Christmyer This starter pack is what every leader needs to begin Unlocking the Mystery of the Bible. It includes: •4 DVD Set (eight 30-minute sessions presented by Jeff Cavins) •Leader's Guide (with The Bible Timeline Chart and Bookmark) •Student Workbook (with The Bible Timeline Chart and Bookmark) Each study participant should have a Student Workbook, and each small-group facilitator should have a Leader's Guide. 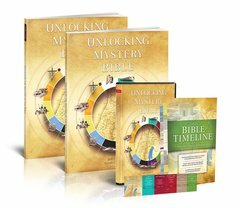 About Unlocking the Mystery of the Bible: This engaging journey through Salvation History provides the easiest way to understand the Bible. Unlocking the Mystery of the Bible makes the complex simple. It helps you uncover the story woven throughout Scripture so that you can get the "big picture" of the Bible and understand what it is all about. The Bible is a story about the Father's unfailing love for you - a love that you are now called to share with others.